Swimmers from the San Francisco-based Olympic Club compete during the Trans Tahoe Relay on Saturday, July 22. Nearly half a century ago members of the San Francisco-based Olympic Club challenged each other to a relay race across Lake Tahoe. On that summer day in 1976, the Trans Tahoe Relay was born, and has since become one of the largest open water swims in the world, attracting some of the world’s best distance swimmers as part of roughly a thousand participants competing in the annual race. This year’s event was held July 21 and attracted roughly 200 teams of six members apiece to tackle the roughly 10-mile swim between the start at Sand Harbor and the finish line at Skylandia State Park & Beach in Tahoe City. During the race, each swimmer rotates after 30 minutes in the water, and then, if needed, the athletes swim additional 10-minute legs until reaching the finish. For much of the past decade the race has been decided by two squads of swimmers — the Tahoe Eleven Milers, and the two-time defending champion team led by the Olympic Club’s Chad La Tourette. This year’s event would be no different as the two teams of swimmers pulled ahead of the pack midway through the event. A medical problem would later force the Tahoe Eleven Milers out of the race, allowing for the team from the Olympic Club to take a dominant victory with a time of 3 hours, 24 minutes, 59 seconds. Stiff Ripples, led by Mike Kiedel was second with a time of 3:42:03; followed by Real Housewives of the Olympic Club, led by Colin Babcock, with a time of 3:45:06. La Tourette, who has captained the team in each of its past three wins, was the first to enter the water for his team on a day that he said was one of the most pristine of any of his years racing at Tahoe, which presented a challenge in itself for a team that trains in the waters off San Francisco without wetsuits. La Tourette said the team’s recent streak of wins broke up a dominant run of first-place finishes by Tahoe Eleven Milers, and while the Olympic Club’s swimmers are world-class in their skill level, many don’t get the kind of water time to train as hard as they once did. “For me it’s like organizing a very young group of working professionals who are trying to get into the pool once or twice a week, but it’s a challenge because they are so early into their (professional) careers, and it’s been a few years since they were actually competing,” La Tourette said. 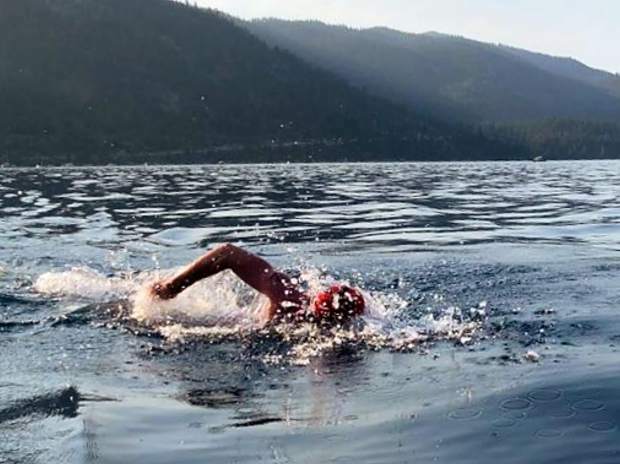 Many of the same swimmers, including La Tourette, will return to the area on Saturday, Aug. 11 for the 38th annual Donner Lake Open Water Swim. The 2.7-mile swim is sold out, according to race organizers. “That’s one of the most beautiful venues for open water in the world,” said La Tourette.